Move over, Oysters Rockefeller and Oysters Mornay! 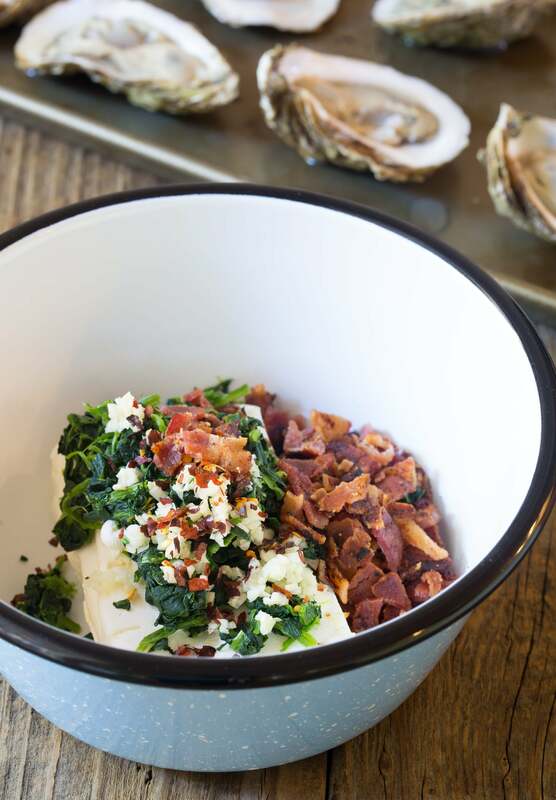 This modernized Three-Cheese Baked Oysters Recipe, in the shell with cheese and bacon, is perfect for the holidays! Of all the specialty foods available these days, I am quite partial to oysters. It’s pure joy to sit at a beach-side seafood shack and eat raw oysters, in the summer months, with an ice cold beer. However, the holidays are the perfect time to splurge on oysters! Oysters are naturally available all year long. Yet, the rule-of-thumb for oyster season is that they are best in months that end with ER… September, October, November, and December. Some old-timers even go as far as to say you shouldn’t eat oysters in months that do not contain an R (May, June, July and August) because the oysters are reproducing, so the meat is thin and often milky. Honestly, I like oysters all year. Plump or thin. Watery or milky. Raw, steamed, grilled or baked! 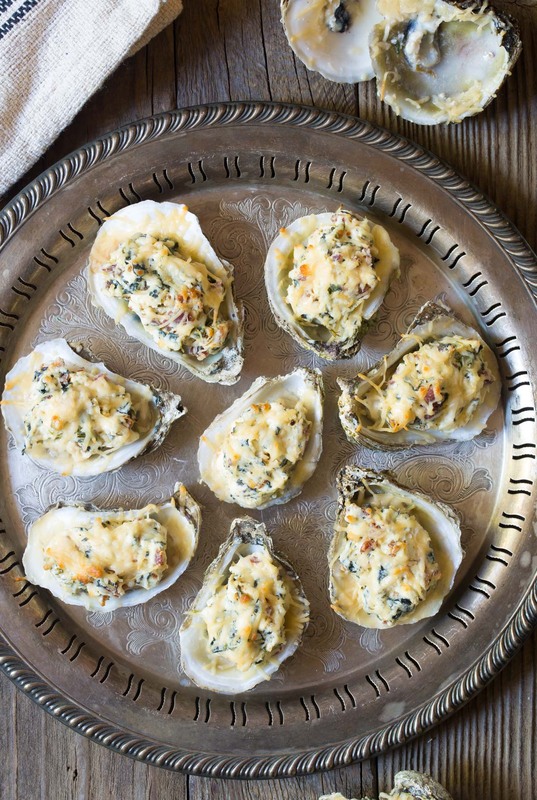 Today’s Three-Cheese Baked Oysters Recipe is a modern take on traditional baked oysters in the shell preparations like Oysters Rockefeller and Oysters Mornay. We’re using fresh shucked oysters with a cheesy molten filling that takes less time and effort to make than classic recipes. Yet this shortcut recipe lacks nothing in flavor. 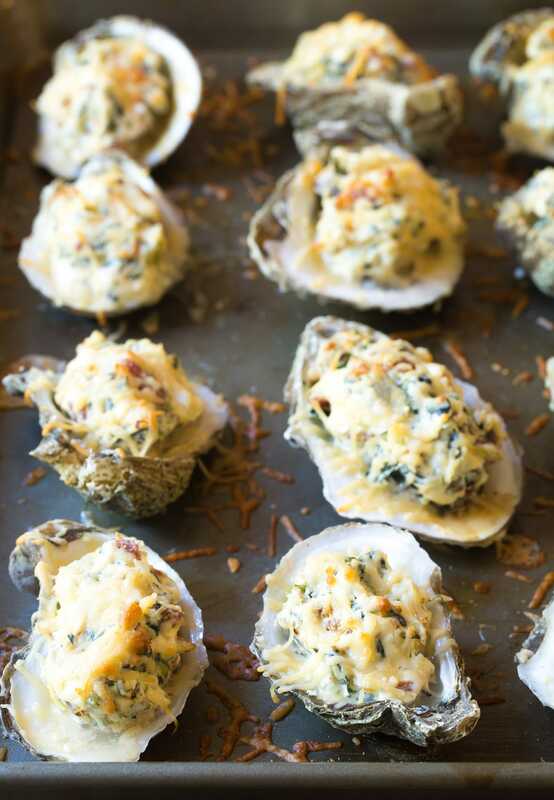 Our baked oysters with cheese, bacon, spinach, and garlic are bold and zesty! How Do You Cook Oysters In The Oven? How long does it take to bake oysters? It depends on the temperature. 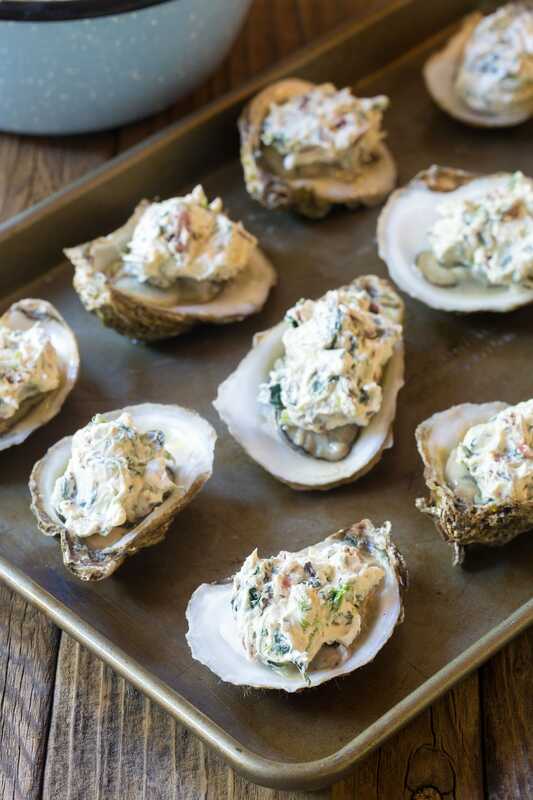 If you are covering the oysters with a topping or filling, bake them at a higher temperature for a shorter amount of time. However, if you are baking oysters naked, bake them at a lower temperature. 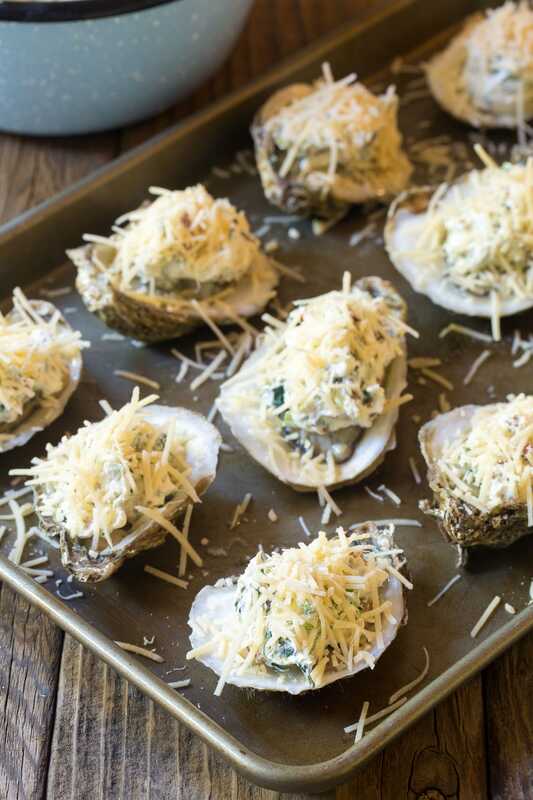 Here we are baking this Three-Cheese Baked Oysters Recipe for 8-10 minutes at 450 degrees F. Just long enough to plump up the oysters and melt the cheese filling. You do not want to over-bake the oysters, as they turn rubbery in texture. Fresh oysters – Select 12-14 average sized oysters, or 16-20 small oysters. Make sure the oysters are completely closed and that there are no cracks in the shells. Try to buy them the day you plan to use them, so you don’t have to store live oysters. Then give them a quick rinse and scrub before shucking. Cream cheese – The perfect base for any cheesy recipe. Shredded white cheddar – Bold flavor and mega melting power. Crumbled bacon – Cooking fresh bacon, then crumbling it, is best. Yet if you are in a hurry you can buy bacon bits for this recipe. Chopped spinach – To make sure the spinach doesn’t release too much moisture into the oysters, use thawed frozen spinach and squeeze out the liquid. 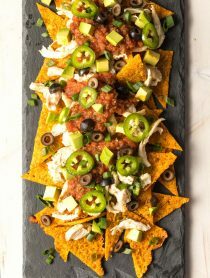 Crushed red pepper – For kick! Parmesan cheese – Creates the perfect nutty golden top. Shuck the oysters – See our full shucking tutorial for extra help. Mix the cheese filling – Use softened cream cheese to speed up the process. 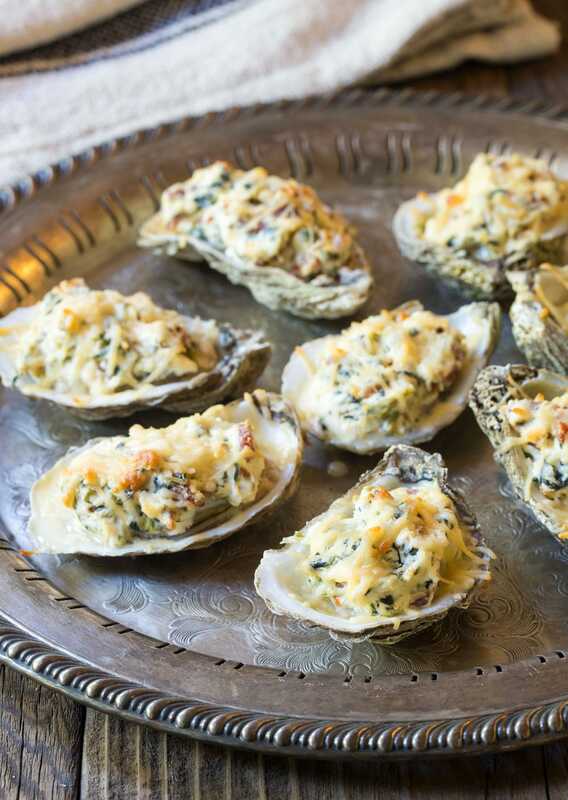 Cover the oysters with cheese filling – Give each oyster a generous spoonful. Sprinkle with parmesan cheese – The crowning glory. Move over, Oysters Rockefeller and Oysters Mornay! 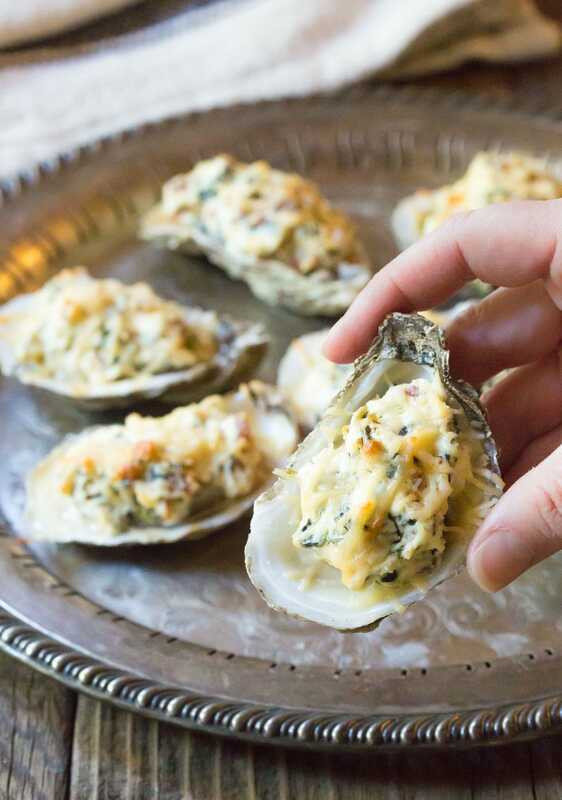 This modernized Three-Cheese Baked Oysters Recipe in the shell with cheese and bacon are perfect for the holidays! 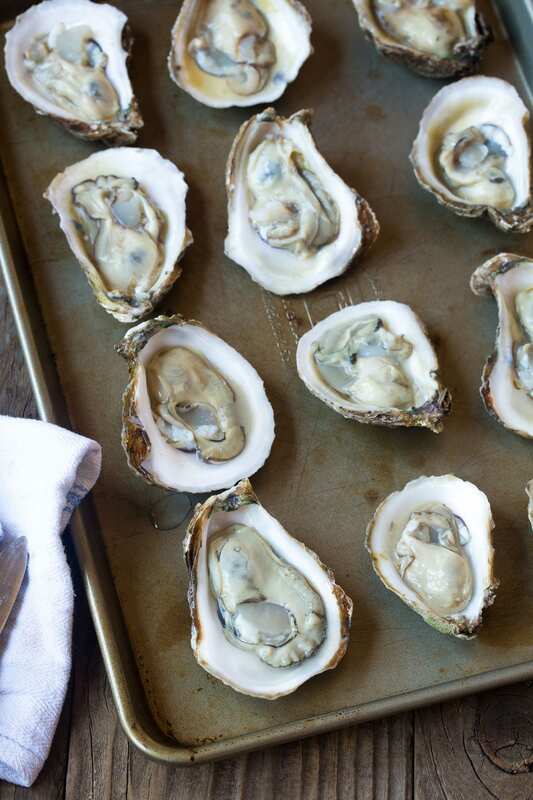 How to Shuck Oysters: Place one oyster in a folded dish towel. Look for the natural hinge in the small end of the oyster. Insert the tip of an oyster shucking knife into the hinge and firmly dig and twist. Once the oyster is open, wipe the edge of the knife on the towel. Then run the edge of the knife under the oyster to release it from the shell. Leave the oyster in the bottom half of the shell. Preheat the oven to 450 degrees F. Set the oysters in their shells on the baking sheet. Squeeze the spinach to remove all excess liquid. In a medium bowl, combine the softened cream cheese, white cheddar, bacon, chopped spinach, garlic, and crushed red pepper. Mix well. Spoon a dollop of cheese filling over the top of each oyster. Sprinkle the tops with parmesan cheese. Bake for 8-10 minutes, until the cheese is golden. Serve warm. Need extra help shucking oysters? Check out our How To Shuck Oysters Tutorial post! 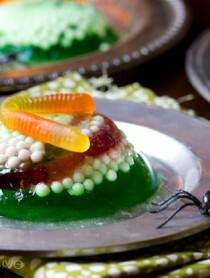 This is a very easy recipe and taste great. I had one pop just before 10 min, so you might want to stand back until your ready to take them off. Fantastic recipe. 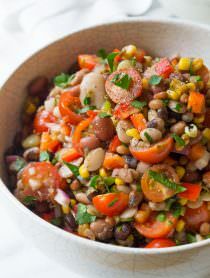 Easy to make and even better to eat. For our personal preferences we cut the garlic in half. We also replaced half of the Parmesan and half the mozzarella with plain breadcrumbs.